Community Eye Health Journal » What’s new in azithromycin? Comm Eye Health Vol. 17 No. 52 2004 pp 54 - 56. Published online 01 December 2004. Corresponding author: Anthony Solomon, International Centre for Eye Health, London School of Hygiene and Tropical Medicine, Keppel Street, London WC1E 7HT, UK. Trachoma is caused by repeated ocular infection with the bacterium Chlamydia Trachomatis. It is, therefore, logical that anti-chlamydial antibiotics have become a key component of the SAFE strategy. Tetracycline is an effective anti-chlamydial agent. However, because of its effect on growing teeth, oral tetracycline is not recommended for children less than 12 years of age, or for pregnant or breastfeeding women. Tetracycline eye ointment is safer than oral tetracycline, but is difficult and unpleasant to apply: if treatment is unsupervised, compliance for a full six-week course is thought to be poor. Fortunately, during the 1990s, it was shown that ocular C. trachomatis infections can successfully be cleared with a single oral dose of the antibiotic azithromycin,1 and that treatment of whole communities is practical, acceptable to the community, effective,2 and results in a low incidence of adverse reactions.3 An operational comparison suggested that directly-observed singledose azithromycin is more effective at achieving clinical cure of active trachoma than six weeks’ unsupervised tetracycline ointment.4 The main limitation to the use of azithromycin for trachoma control is its cost, which is high if the drug is not donated. 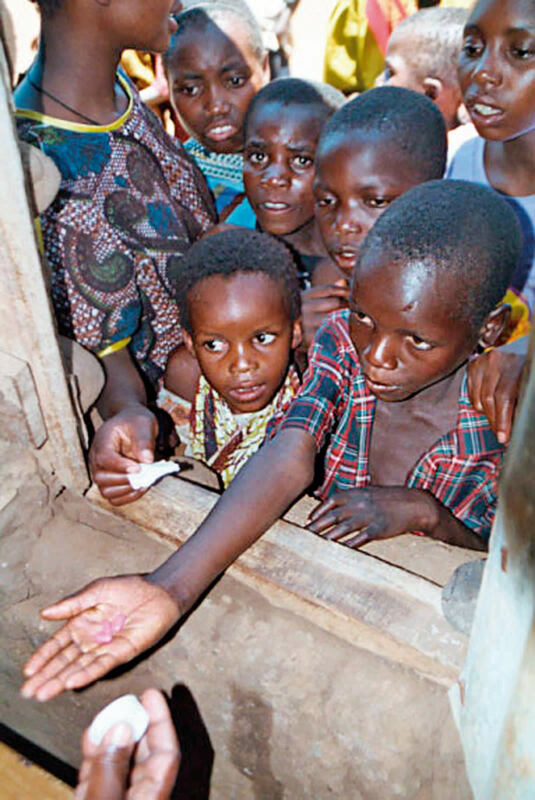 In 1999, when this journal last published a full issue on trachoma, azithromycin’s manufacturer (Pfizer Inc.) was establishing donation programmes in five trachoma-endemic countries.3 The scheme has now been expanded to include a number of additional countries. Several other developments in the last five years have had an impact on the way in which recipient programmes use donated azithromycin to control trachoma. 1 Determine the district-level prevalence of TF in 1 to 9 year-old children. If this is 10 per cent or more, conduct mass treatment with antibiotic throughout the district. If this is less than 10 per cent, conduct assessment at the community level in areas of known disease. In communities in which the prevalence of TF in 1 to 9 year-old children is 10 per cent or more, conduct mass treatment with antibiotic. In communities in which the prevalence of TF in 1 to 9 year-old children is 5 per cent or more, but less than 10 per cent, targeted treatment should be considered. In communities in which the prevalence of TF in 1 to 9 year-old children is less than 5 per cent, antibiotic distribution is not recommended. Who should be given azithromycin? Trachoma is a community-level problem, and must be managed at the community level: treatment of individuals presenting to health facilities will have little impact on transmission. Previously, therefore, the World Health Organization (WHO) recommended community-level assessment of the prevalence of TF and TI (signs of active disease) to determine whether or not community-based distribution of antibiotics was warranted.6 Mass distribution of antibiotics (treatment of all members of all families in the community) was recommended if (a) the prevalence of TF in children was 20 per cent or greater, or (b) the prevalence of TI in children was 5 per cent or greater. Targeted distribution (treatment of all members of any family in which one or more family members had TF or TI) was recommended where the prevalence of TF in children was 5 per cent or greater, but less than 20 per cent.6 Three important changes have recently been made to these guidelines. Recognising that, to achieve global elimination of trachoma, large populations will need to be given antibiotics, WHO suggest that initial assessment of the prevalence of disease (and determination of the need for antibiotic distribution) be made at the district level, rather than the community level. Treatment of whole districts should help to minimise re-infection through contact between people from treated communities and those from untreated communities. Because TF is a more reliable sign of trachoma than TI, determination of the need for antibiotic distribution should be based only on the prevalence of TF. At first, azithromycin being distributed for trachoma control was withheld from pregnant women because there were no data demonstrating that it was safe in this group.3 A randomised controlled trial of the effect (on pregnancy outcome) of presumptive treatment of mothers for sexually transmitted diseases has recently provided useful data. The study compared babies born to mothers given three or four different STD treatments, including 1g azithromycin, during pregnancy, with those not given any of these drugs; neonatal death, low birth weight, pre-term delivery and infant ophthalmia were all significantly less common in the treated group.8 National programmes should consider this evidence, which seems to support the use of azithromycin in pregnancy. In most trachoma-endemic areas, there are insufficient trained medical and nursing personnel. A pilot study in Ghana showed that trained community health volunteers could safely manage and dispense azithromycin to both children and adults.11This cadre now routinely assists in antibiotic distribution throughout National Trachoma Control Programme intervention areas in Ghana. Literate volunteers from trachomaendemic populations also give useful assistance in a few other countries: cooperation with other community-based disease control programs should be considered. How should the dose of azithromycin be determined? For trachoma control purposes, the recommended dose of azithromycin is one dose of 20mg of medicine per kilogram body weight, to a maximum of 1g. However, weighing scales are expensive to buy, bulky and heavy to transport, and are sometimes unreliable in the field. Heightbased azithromycin dosing11, 12, 13 is now accepted as an economical, safe, effective and convenient alternative. Since the relationship between height and weight varies from one population to the next, programme managers should not use generic height-based dosing scales, but rather ensure that the scale used is appropriate for the specific recipient population. How often and how many times should azithromycin be given? At present, there are no good data demonstrating the relative effect of different frequencies of antibiotic distribution. Computer simulations of the effect of antibiotics suggest that in areas where trachoma is moderately endemic, annual treatment should be undertaken, but that in hyperendemic areas (prevalence of TF in children >50 per cent), treatment every six months may be required.10,14 Trials to test this hypothesis are currently in progress. In the meantime, antibiotics should be distributed every 12 months. Revised WHO guidelines suggest that, once a decision has been made to treat a district or a community with antibiotics, three annual distributions should be undertaken before reassessing the area as to the need to stop or continue. What impact will distribution of azithromycin have on trachoma? In a study village in Northern Tanzania, 94 per cent of 978 residents were given a singledose of azithromycin, and a further 4 per cent given tetracycline eye ointment. The prevalence of ocular C. trachomatis infection fell from 9.5 per cent before treatment to 2.1 per cent two months afterwards, and 0.1 per cent (only one resident infected) at two years.15 If these results could be replicated at national level by achieving high coverage with azithromycin throughout entire endemic districts, very rapid progress could be made towards global trachoma elimination. Hypoendemic area – an area in which the particular disease or condition has a low (but not zero) prevalence. Mass distribution (of antibiotics) – treatment of all members of all families in the community or district. Operational comparison – a comparison between different treatments made under operational conditions, such as in the context of a disease control programme. In the case of a comparison between the effectiveness of azithromycin and that of tetracycline, azithromycin would be directly-observed, and tetracycline would be applied at home, unsupervised, by the patient or their parent. Prevalence – the number of cases of a disease or condition that are present in a defined population at a particular point in time. Targeted distribution – treatment only of subsets of the community, as opposed to ‘mass distribution’. In trachoma, targeted distribution often refers to identification and treatment of families in which there are one or more members with TF or TI, but other targeted distribution strategies have also been used. Will mass distribution of azithromycin for trachoma control promote antibiotic resistance? There is concern that annual mass distribution of single-dose azithromycin will encourage the development of resistant strains of C. trachomatis or other pathogens. There are as yet no published data showing the effect of azithromycin on antibiotic resistance in ocular C. trachomatis isolates. Selection of antibioticresistant conjunctival S. pneumoniae strains following azithromycin distribution has been identified, but the clinical signifi- cance of this is unclear16 Three published studies have examined the impact of azithromycin given for trachoma on nasopharyngeal S. pneumoniae. The first, in Australia, showed an increase in the prevalence of azithromycin resistance in S. pneumoniae from baseline to two weeks after treatment; the prevalence of resistance fell between two weeks and two months, and again between two months and six months.17However, follow-up was incomplete, there was no control group, and background antibiotic use is likely to be higher in Australia than in most other trachoma-endemic areas. The second study, in Nepal, found resistant S. pneumoniae strains in only a very small proportion of children, all of whom had been given azithromycin on two separate occasions. This suggests that multiple rounds of azithromycin may be necessary to select for resistance in nasopharyngeal pneumococci.18 The third and largest study published to date was conducted in Tanzania. More than 1,200 children were swabbed at baseline, two months after treatment and six months after treatment; only one macrolide (azithromycin-like drug)- resistant isolate was identified, six months after azithromycin distribution.19 Perhaps if background macrolide resistance is rare, mass distribution of azithromycin will have little impact on S. pneumoniae antibiotic sensitivities. What if azithromycin is not available? If azithromycin is not available to the programme in your district, the World Health Organization recommends community based distribution of tetracycline eye ointment using the same guidelines detailed above. However, the ease of use of azithromycin and the likelihood that recipients are more compliant with treatment, make it the first-line antibiotic for trachoma control: endemic countries are encouraged to consult the International Trachoma Initiative to find out whether donated azithromycin can be accessed by their national control programme. The authors are very grateful to Dr Jacob Kumaresan and Dr Silvio Mariotti for helpful comments on a draft of this manuscript. 1. Bailey RL, Arullendran P, Whittle HC, et al. Randomised controlled trial of single-dose azithromycin in treatment of trachoma. Lancet 1993; 342:453-6. 2. Schachter J, West SK, Mabey D, et al. Azithromycin in control of trachoma. Lancet 1999; 354:630-5. 3. Whitty CJ, Glasgow KW, Sadiq ST, et al. Impact of communitybased mass treatment for trachoma with oral azithromycin on general morbidity in Gambian children. Pediatr Infect Dis J 1999; 18:955-8. 4. Bowman RJ, Sillah A, Van Dehn C, et al. Operational comparison of single-dose azithromycin and topical tetracycline for trachoma. Invest Ophthalmol Vis Sci 2000;41:4074-9. 5. West SK. Azithromycin for control of trachoma. Comm Eye Health Journal 1999; 12:55-6. 6. Primary health care level management of trachoma (WHO/ PBL/93.33). Geneva: World Health Organization, 1993. 7. Burton MJ, Holland MJ, Faal N, et al. 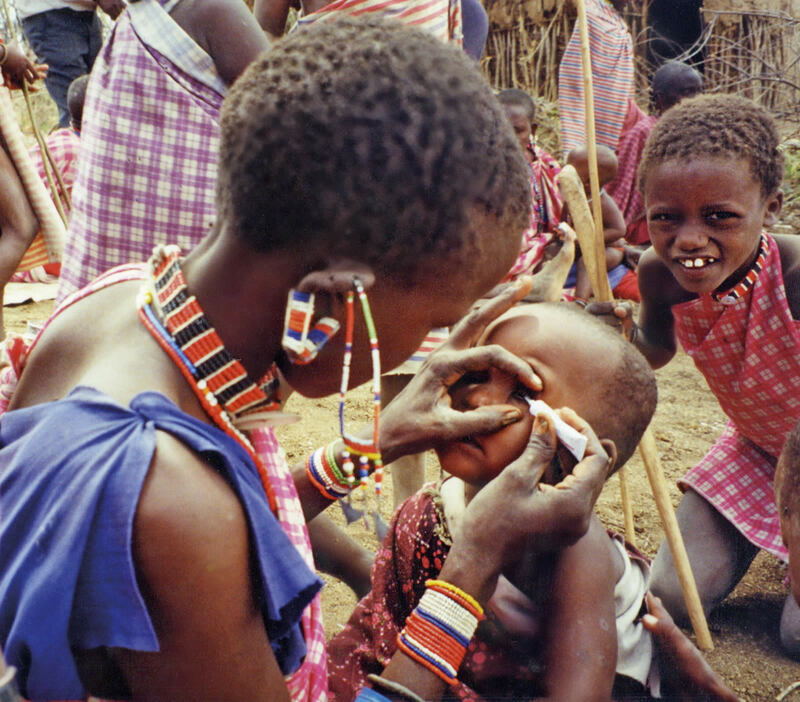 Which members of a community need antibiotics to control trachoma? Conjunctival Chlamydia trachomatis infection load in Gambian villages. Invest Ophthalmol Vis Sci 2003; 44:4215-22. 8. Gray RH, Wabwire-Mangen F, Kigozi G, et al. Randomized trial of presumptive sexually transmitted disease therapy during pregnancy in Rakai, Uganda. Am J Obstet Gynecol 2001; 185:1209-17. 9. Solomon AW, Holland MJ, Burton MJ, et al. Strategies for control of trachoma: observational study with quantitative PCR. Lancet 2003; 362:198-204. 10. Melese M, Chidambaram JD, Alemayehu W, et al. Feasibility of eliminating ocular Chlamydia trachomatis with repeat mass antibiotic treatments. Jama 2004; 292:721-5. 11. Solomon AW, Akudibillah J, Abugri P, et al. Pilot study of the use of community volunteers to distribute azithromcyin for trachoma control in Ghana. Bull World Health Organ 2001; 79:8-14. 12. Basilion EV, Kilima PM, Turner VM, et al. 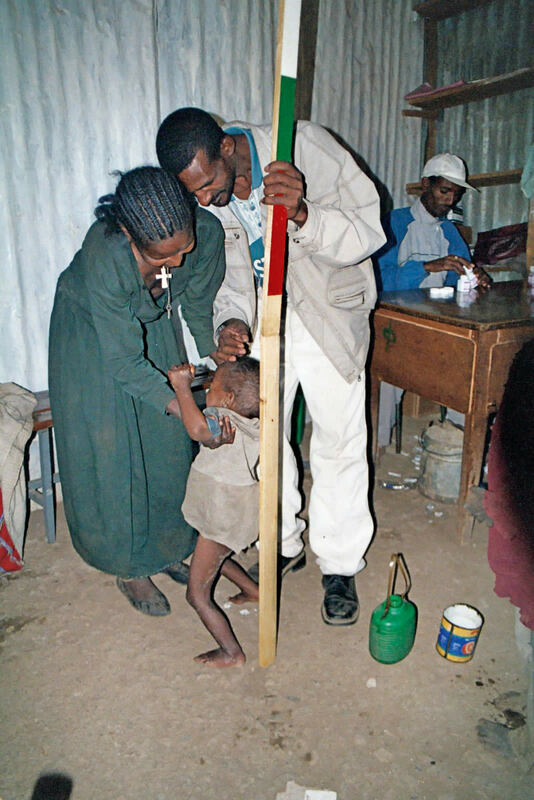 Height as a proxy for weight in determining azithromycin treatment for paediatric trachoma. Trans R Soc Trop Med Hyg 2002; 96:691-4. 13. Munoz B, Solomon AW, Zingeser J, et al. Antibiotic dosage in trachoma control programs: height as a surrogate for weight in children. Invest Ophthalmol Vis Sci 2003; 44:1464-1469. 14. Lietman T, Porco T, Dawson C, et al. Global elimination of trachoma: how frequently should we administer mass chemotherapy? Nat Med 1999; 5:572-6. 15. Solomon AW, Holland MJ, Alexander ND, et al. Mass treatment with single-dose azithromycin for trachoma. N Engl J Med 2004; 351:1962-71. 16. Chern KC, Shrestha SK, Cevallos V, et al. Alterations in the conjunctival bacterial flora following a single dose of azithromycin in a trachoma endemic area. Br J Ophthalmol 1999; 83:1332-5. 17. Leach AJ, Shelby-James TM, Mayo M, et al. A prospective study of the impact of community-based azithromycin treatment of trachoma on carriage and resistance of Streptococcus pneumoniae Clin Infect Dis 1997; 24:356-62. 18. Fry AM, Jha HC, Lietman TM, et al. Adverse and beneficial secondary effects of mass treatment with azithromycin to eliminate blindness due to trachoma in Nepal. Clin Infect Dis 2002; 35:395-402. 19. Batt SL, Charalambous BM, Solomon AW, et al. Impact of azithromycin administration for trachoma control on the carriage of antibiotic-resistant Streptococcus pneumoniae. Antimicrob Agents Chemother 2003; 47:2765-9.